THE wattle is in flower. I can feel spring. I can. I can feel it. Even my Pinterest pins are starting to reflect a turning of the seasons. THINGS TO MAKE AND DO: Hanging glass jars to light warmer evenings outdoors. THINGS TO COOK AND EAT: Not Without Salt's soft tacos. You just have to visit this pin and trace it back to the source for the sweet video alone. THINGS TO DROP DOUGH ON: A dress that doesn't require a layer underneath and over the top. THINGS TO HANG ON THE WALL: A wall-mounted circular shelf to hold sweet spring posies. I agree...I can feel spring coming too. The other day I made a new patchwork runner for my table in very spring colours...just to celebrate spring's nearly arrival! 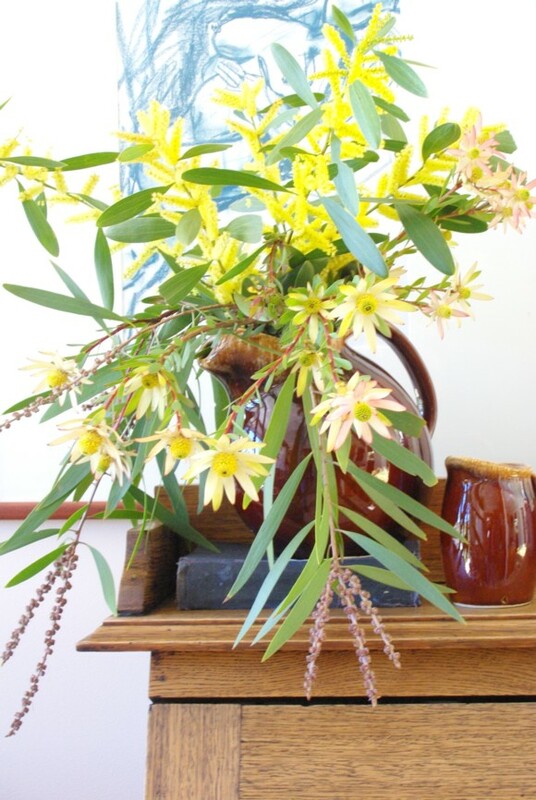 The wattle on your sideboard is gorgeous.